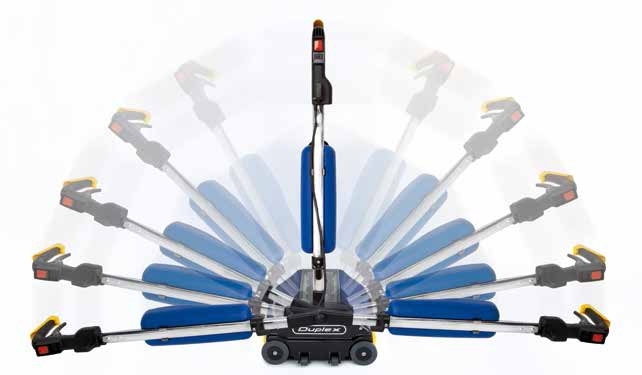 The new Duplex 280i scrubber is ultra compact. It is suitable for professionals cleaning small spaces as well as for domestic use.The Duplex is universal because it is used on all types of floors or carpets (different brushes are available). The new Duplex 280i Soil-Dryer is a gem of genius . 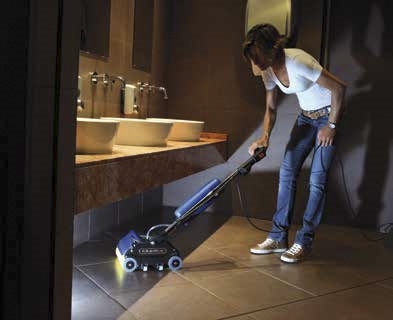 Compact in its dimensions, it is perfect for small spaces, it manages to reach the narrowest spaces. And this, thanks to the bidirectional handle which, as in all models of the Duplex family, allows to change the direction of the race with the simple Inversion of this handle. Constructed with an aluminum casing, to ensure the watertightness of each of its components and thus to prevent infiltration of water and dust inside, the latest addition to the Duplex family combines functionality and maneuverability with great reliability. The Duplex 280i is easy to use , easy to transport from one room to another, and easy to store, because it clutches little; using it is a real entertainment. The duplex is completely waterproof: no dust or residues can enter it. Its maneuverability is extreme, and the movement is particularly easy whether it is from left to right, from front to back or vice versa. it has a bidirectional washing system. To stop the machine, simply position the handle vertically. By operating the handle, the solution is dispensed onto the brushes. Double washing system: washing with soaking then recovery or washing and simultaneous recovery. Easy to use, to transport from one room to another and to store: using the Duplex 280i machine is a real pleasure. And she weighs only 13 kg. The central position of the engine and the small top tray allow a perfect balance: important feature to ensure lightness and maneuverability in all work situations. This is the only machine in the world completely waterproof: thus, no dust or water or other types of residues are introduced inside. The nickel-plated housing protects the mechanical transmissions and the engine, which therefore requires no maintenance or lubrication. It weighs only thirteen kilos, so it can be lifted by anyone with ease, and it can be transported from one room to another, tilting to one side, since it slides on two small wheels provided for this purpose. Mes sols sont revenus à neuf et l'utilisation est simple. Un peu peur au début, mais usage facile et très effcicace . Test aujourd’hui et c est parfait. Bonne qualité, mais l'utilisation de l'appareil nécessite de la pratique, notamment pour absorber toute l'eau au sol. Produit convenant tout à fait à ce que nous recherchions depuis longtemps. Pratique, facile d'emploi et résultats parfaits. Sol parfaitement et rapidement nettoyé. Un seul regret : Pourquoi n'avoir pas prévu une visibilité du niveu d'eau du réservoir ?